Submersible waste water level sensor with optional intrinsic safety certification for monitoring the level of sewage and effluent in water treatment plants. The LMK307 immersible waste water level sensor has a stainless steel housing and a flush ceramic diaphragm which prevents from the build up of solids of time and makes it easy to clean. Available in level ranges from 4 up to 250 meters of water gauge. Measure the level of leachate in above ground tanks on landfill sites. Leachate is the liquid that has drained from a land-fill site which consists of rainwater mixed with harmful substances from the breakdown of landfill waste. Leachate must be prevented from escaping into the surrounding groundwater and therefore it is extracted from the landfill and stored in tanks where it is eventually transported away for treatment. Would this sensor need to be calibrated to a particular shaped tank, to tie a voltage or amperage to both the full and empty levels? The sensor measures the hydrostatic pressure or liquid level height, and therefore it is independent of the shape of tank. The shape of the tank becomes important when you need to convert the liquid level to a volume. This volume conversion is normally conducted by entering non-linear calibration points at incremental levels or applying a mathematical formula into tank contents instrumentation, which is then used to convert the linear level output signal from the sensor. It seems that the sensor is monitoring pressure at a particular location in a tank, that would be considered zero’d, and then as the fluid level drops the voltage (or amperage) output of the sensor changes. As standard it actually works in the opposite way, and measures zero when the fluid level is at the same height as the sensor or lower. The sensor is a pressure sensor and measures the hydrostatic pressure applied by the liquid above it, typically a 1 metre high column of water will generate 100 millibar of pressure. From this pressure reading the sensor can be calibrated in mWG (meters water gauge) and the output from the sensor scaled to reflect this. How is this sensor installed? The sensor is suspended in the media by its cable as close to the bottom of the tank as possible. If the liquid is turbulent, or you need to prevent the sensor moving around, then it is recommended to lower the sensor into a stilling tube or fix it to the side of the tank using C bracket. Is it possible to mount this sensor to the side of a tank, via an NPT interface? No, this sensor does not have a suitable fitting for mounting on the outside of a tank, instead we would suggest the DMK 331 which has the same liquid compatibility as the LMK 307, and can also be mounted to the external surface of a tank via a 1/4 or 1/2 NPT tapered male thread fitting. Is it possible to measure the static head pressure of an emulsion containing solid particles ~7mm diameter? If there is significant fluid movement you may need to support and protect the sensor and cable from damage. To prevent the solid particles touching the sensor diaphragm, we would suggest keeping the nose cone fitted. However, if the emulsion has a high viscosity this may lead to clogging of the nose cone. This will prevent the static head pressure being applied to the sensing diaphragm. The nose cone should be regularly inspected and cleaned when necessary to remove any sign of clogging. We want to measure the liquid contents of solvent paint in a 4 metre high cone bottom round tank. There is a hole in the top of the tank for lowering the sensor inside. 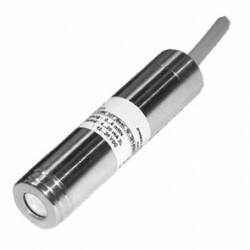 We would suggest a LMK 307 with FKM seals and FEP cable. 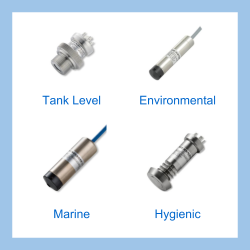 Please select the options you require for the LMK307 Submersible Waste Water Level Sensor in your application and request a quote. Send us your enquiry for LMK307 Submersible Waste Water Level Sensor to get assistance with this product type.